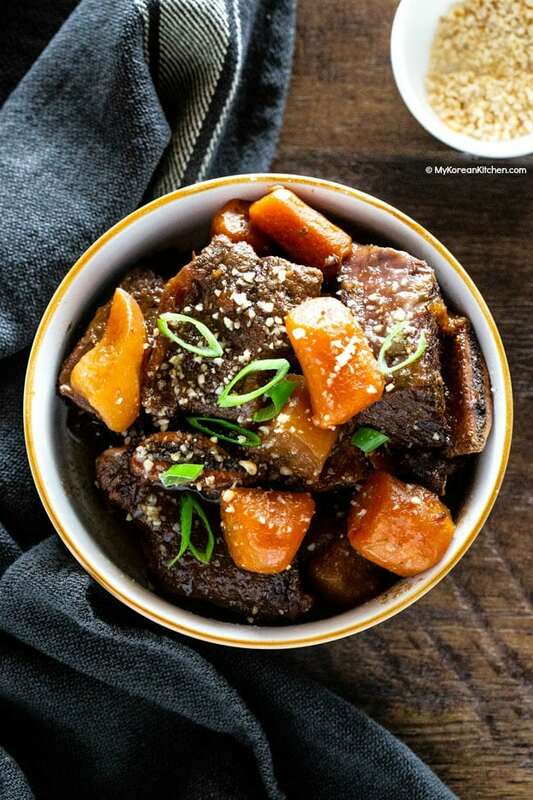 Instant Pot Korean short ribs recipe. 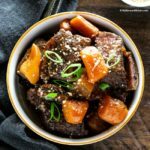 Try this super flavorful Korean short ribs made in an Instant Pot (or in any other electric pressure cooker). The sticky sauce glazed meat is bone fall apart tender and lip-smacking delicious! Today, I’m sharing my first instant pot recipe. In case you don’t know, Instant Pot is a hugely popular electric pressure cooker in North America and the UK. And, after a long wait, I finally got hold of this gadget a few months ago. In case you’re curious, mine is a 6 quart / 5.5 litre sized pot. 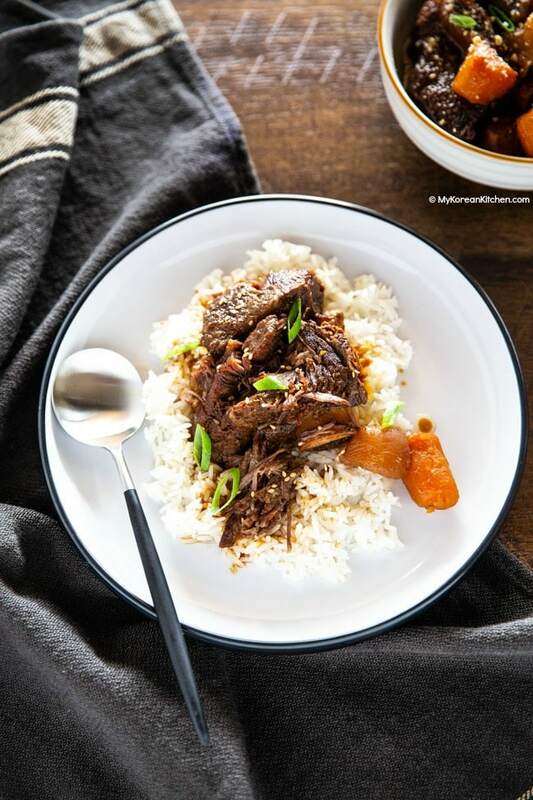 During this time, I have tried several Korean recipes in this pressure cooker, but by far the best one to come out so far is today’s braised Korean short ribs (aka galbi jjim cooked in Instant Pot)! Korean cooks love clean taste, so before we cook ribs, we like to prep them a bit. First soak them in cold water. You will notice that the water will soon have a red hue. Many will call it blood, but I recently learnt that it’s actually myoglobin, a protein that’s found in the muscle tissue of the meat. Soaking time is also an opportunity to get rid of any residue bone fragments on the meat as well. Many Korean cooks will recommend soaking the ribs for a few hours (even overnight! ), but I think you can easily lose the meat flavor by doing so. So I recommend you to just do it while you’re waiting for the water to boil up for the next prep work. I love this step. Yes, for sure it’s an additional step that takes time, but this brief boiling of the ribs helps the scum to float, so that you can easily drain it and rinse it. Also, fat and other tough tissue from the meat can be more easily removed by boiling too. (A lot easier to cut compared to when the ribs are raw). I don’t know about other electric pressure cookers, but Instant Pot has two venting options – natural release and quick release. But you can also manually do “fast natural release”, which falls in between the two categories. Fast natural release is basically, naturally venting the pressure for some time (15 mins in this recipe) then switching the vent option to quick release to depressurize the pot completely. Why? If you decide to go with natural release, it can take anywhere from between 15 mins to 30 mins to depressurize the pot. And, it’s a long time to wait since you will want to move on to the next step, which is sautéing the vegetables in the same pot. If you decided to do the quick release, then you will notice that the ribs are not as tender as they could be. And, I believe this is to do with the sudden pressure change, because you’re releasing the pressure too suddenly. So to achieve the optimal short rib texture and also to save time, I recommend you to do fast natural release when following this recipe. You might be tempted to add the vegetables (carrots and radishes) with the meat and pressure cook all together to save some cooking time. (Yes, I’ve done that!) But you will end up with undesirably sad looking carrots and radishes. Since you will have to thicken the sauce (because there is a lot of liquid after pressure cooking), I recommend you sauté the vegetables to cook them and also to thicken the sauce. 20 minutes is all you need and the outcome is marvelous! Short ribs are a fattier part of beef and you will notice it in the sauce after pressure cooking. If you want to reduce the fat amount, you can skim it by cooling the sauce in the fridge / freezer for a few hours. The fat will harden on the surface of the sauce, so you can easily scrape off with a small spoon (option 1). The downside of this method is that it delays your dining time until it is done. Alternatively, you can use a fat separator after sautéing the vegetables (option 2). It does make the job neat. 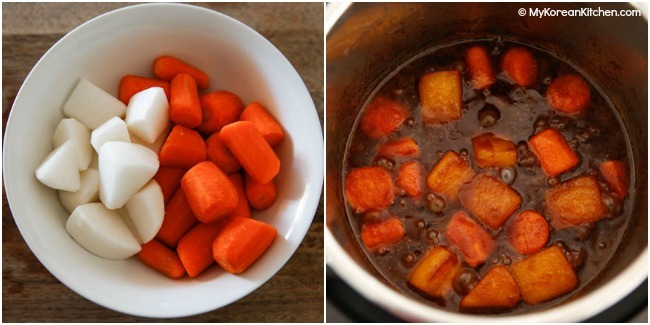 If you don’t have an Instant Pot, you can use other pressure cookers too. 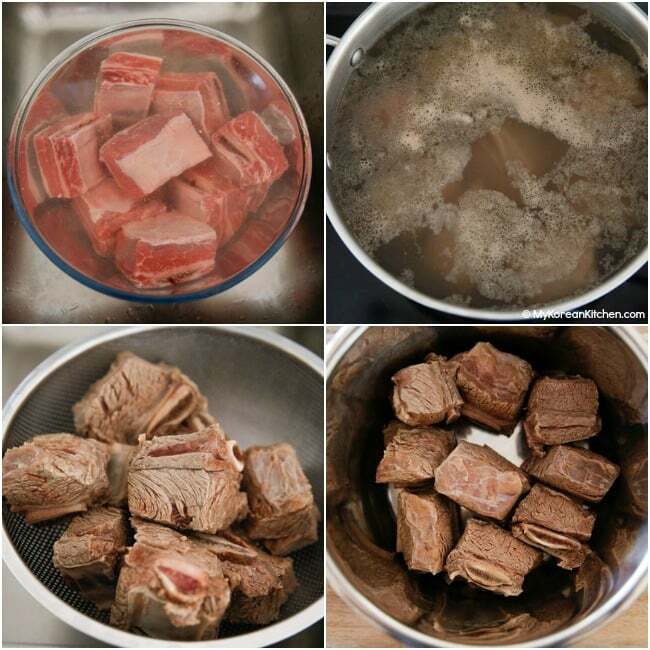 I don’t have experience with other brands, but one of my readers converted my traditional galbi jjim recipe for her Philips pressure cooker, and she reported that it worked well. 1. Fill a large pot with some water (about 2/3 of the pot) and bring it to boil. While the water is boiling, soak the ribs in cold water. Once the water in the pot is rapidly boiling, transfer the short ribs into the pot and boil them over medium high heat for 6 to 8 minutes. Drain the water away and rinse the ribs in cold running water. Cut off any excess fat (with a pair of scissors) from the ribs. 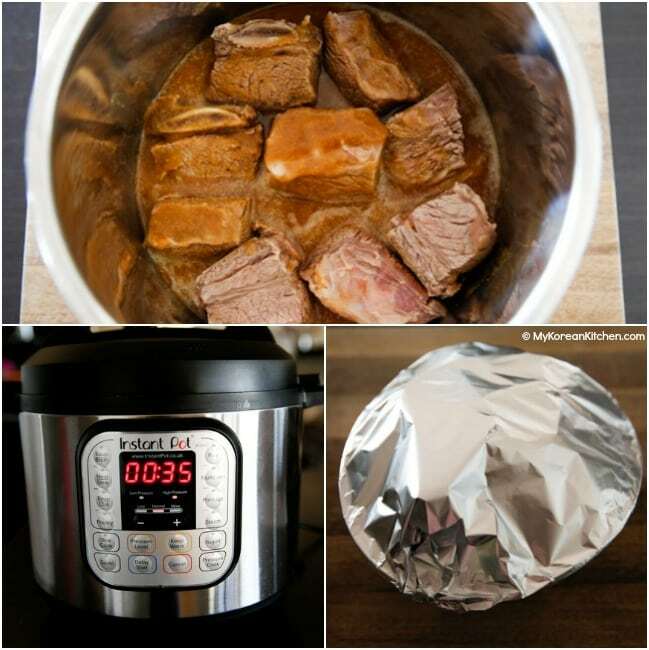 Place the short ribs in the instant pot. 2. Meanwhile, blend the sauce ingredients in a mixer or food processor until smooth. 3. Pour the sauce over the short ribs. Put the lid on and make sure the vent is in the sealed position. Set the pot to pressure cook on high for 35 minutes. After the pressure cook cycle is complete, allow the pressure to naturally release for 15 mins (the vent is still closed). Then do quick release and wait until the quick release cycle is complete. Be careful of any remaining steam. Unlock and remove the lid. 4. Add the prepared vegetables into the pot. Set the pot to sauté (normal) for 20 minutes and cook the vegetables until soft. Meanwhile, the sauce will turn thick and glazy. Set the pot to off and transfer the vegetables and the sauce to the meat, then toss to coat. (If desired, you can separate the oil from the sauce as explained in the cooking tips above). Garnish with toasted sesame seeds. 5. Serve the ribs with steamed rice and other Korean side dishes. Steamed vegetables such as broccoli go well too. Super flavorful Korean short ribs made in an Instant Pot. The sticky sauce glazed meat is bone fall apart tender and lip-smacking delicious! Fill a large pot with some water (about 2/3 of the pot) and bring it to boil. While the water is boiling, soak the ribs in cold water. Once the water in the pot is rapidly boiling, transfer the short ribs into the pot and boil them over medium high heat for 6 to 8 minutes. 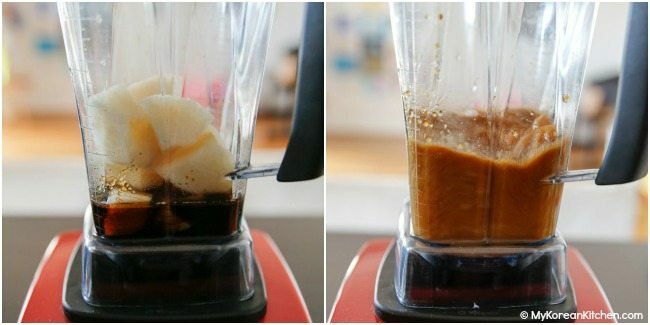 Meanwhile, blend the sauce ingredients in a mixer or food processor until smooth. Pour the sauce over the short ribs. Put the lid on and make sure the vent is in the sealed position. Set the pot to pressure cook on high for 35 minutes. After the pressure cook cycle is complete, allow the pressure to naturally release for 15 mins (the vent is still closed). Then do quick release and wait until the quick release cycle is complete. Be careful of any remaining steam. Unlock and remove the lid. Add the prepared vegetables into the pot. Set the pot to sauté (normal) for 20 minutes and cook the vegetables until soft. Meanwhile, the sauce will turn thick and glazy. 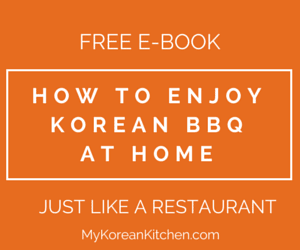 Serve the ribs with steamed rice and other Korean side dishes. Steamed vegetables such as broccoli go well too. This was AMAZING. The first time I made this I followed the recipe to letter and it was wonderful. I got rave reviews from everyone and was told to “KEEP THIS RECIPE.” The next time I followed the directions again but added 1 tsp of chili paste and 1 TBSP of dried red pepper (I was afraid to go all in on the paste because I didn’t know how that would affect the flavor). It turned out just as good but with a little more kick. Both times I served with basmati rice cooked in chicken stock and steamed broccoli and garnished with toasted sesame fresh diced chives which does really add something. I can’t thank you enough for this simple recipe. I’m so happy to hear that you enjoyed my recipe! Thanks for sharing your feedback and also your tweak! I just tried this recipe today. The result was delicious; so sweet and rich in flavor and very similar to the dishes we’ve had from our favorite Korean restaurants in the states and abroad. Thank you for sharing. My husband and I really enjoyed it! Should you decide to make a spicy version, we wouldn’t hesitate to try it. In your recipe, you mention a few times, “Fill the large pot with some water (about 2/3 of the pot) and bring it to boil.” What do you mean by, “THE large pot”? Do you mean the instant pot? It sounds like it because you say, “the” pot. Or do you mean “a” pot….as in “another/different” pot? Either way, please update the instructions throughout this blog to clarify. In my mind, it sounds like you are suggesting boiling the ribs in the instant pot…but, in the photos, I can barely see that it looks like you boil in a different pot. I’m going to boil in a separate pot, but if you update the grammar, it would help. Thx. Sorry for the confusion. I just updated it. 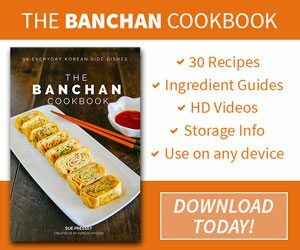 Can I add some spice to this recipe with some gochujang? hi i am trying this recipe for the first time and when i put the vegetables in and try the Saute option, it doesn’t stay on for 20 minutes and my vegetables aren’t tender or soft. Is there something i’m doing incorrectly? Is this your first time using an instant pot? Do you know how to adjust the timer? Can I use store bought marinade for the sauce? I would like to use boneless short rib. Should I still soak and boil the meat? I haven’t cooked with boneless short rib. But if I were you, I would still soak in water but will skip boiling it. At the end, it’s up to you. 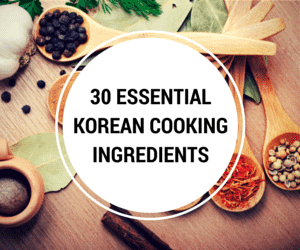 Hi Sue, do you have anymore Instant Pot Korean recipes that you can share? Love this Beef Short Rib recipe and thanks for sharing. Just looking for more dishes to cook in my Instant pot and my hubby love saucy dishes. I don’t have Instant Pot,so,can i pressure cooker for this short ribs?btw, it looks delicious! Sorry, I meant to rate this recipe and it is a five star! Hi Sue, I tried the Instant Pot Korean Short Ribs and it turned out great! Wonderful flavor and like you said, the meat is tender! My family enjoyed it very much. Thank you! Thank you for all your recipes! This one sounds amazingly delicious! Thanks Sue! I’ve been experimenting with Korean flavors in my Instant Pot. Pretty good results so far. This helps! The ribs look great, I need to try them in my Instant pot. Word of caution- do NOT use cheap supermarket sesame oil. It is aweful tasting and will ruin the dish. I use this sesame oil and it tastes great. This looks great. I am so excited to try this. Thanks so much for publishing this recipe.